The “Santas” face off in Frackle Rock. 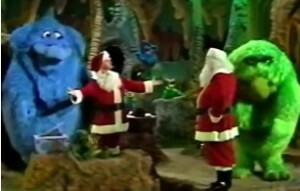 And speaking of Fraggle Rock, The Great Santa Claus Switch actually surprisingly, specifically foreshadows and even provides elements that would later evolve into that seminal program. To begin with, all of Cosmo’s strange monster henchmen, although they generally look extremely different to one another, are collectively known as the Frackles, a name that isn’t only very similar in sound to “Fraggle,” but was also the name that Jim originally considered reusing years later for his fun-loving, cave-dwelling characters on that show before changing the middle sound to “g”. 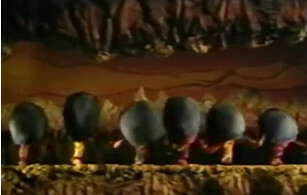 Even more strikingly, however, the world that Cosmo and the Frackles inhabit is so visually reminiscent to Fraggle Rock–like Fraggle Rock, it’s composed of an underground cave system made up of “a million miles of tunnels”–that it almost feels like watching an alternate universe episode of that 1980s show. Why, one of the Frackles is even an early version of the same species of creature as Philo and Gunge–Marjory the Trash Heap’s, small, green, furry subjects! Meanwhile, another of the Frackles, Lothar, a blue, silly but wise prognosticating dragon-like character who wears a fez (Lothar is amazing) and is also played by Jim, has a very similar function to Marjory’s–Cosmo goes to him frequently to seek advice about the future–and a personality similar to the deeply wise, deeply silly Fraggle minstrel, Cantus (another Jim character), along with a voice that sounds like a cross between Cantus’ and Link Hogthrob’s (incidentally, Lothar would make later Muppet appearances, both on The Muppet Show and at Kermit and Piggy’s wedding in The Muppets Take Manhattan). And two of the Frackles are huge, furry, full-body Muppets, Thig and Thog, both of whom resemble Gorgs in their size, if not physical features, and the second of whom has a babyish voice and personality that particularly calls to mind Junior Gorg. And although Thog wouldn’t go on to Muppet fame per se, people remember him today as the huge, fuzzy, roundish, blue guy with the bouncy ears in The Muppet Show‘s opening credits (he also appeared in a few musical numbers and sketches scattered throughout the show’s run). And they aren’t the only recognizable Frackles today. There’s a blue, bird-like, beaky one and a green, beaky one who appeared in various Muppet productions (and although I’m not sure if I remember him from later Muppet things or not, there’s also another green, beaky one with the head of a bird, a long, pop-up neck, and spider-like legs who appeared in The Muppets on Puppets and looks like one of the monsters first developed for The Musical Monsters of Turkey Hollow). 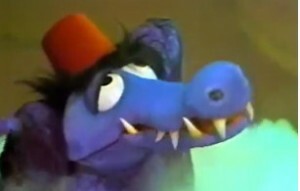 Most important, however, is a certain blueish guy with wide but sad-looking eyes and a strange, long, but droopy nose who lives in Cosmo’s cigar box and is here always referred to as Snarl but who is indeed the very first version of the Whatever who we will come to know and love, the one and only Gonzo the Great! He isn’t yet voiced by Dave Goelz and isn’t the same character at all, but it is still amazingly cool–if a bit disarming–to see him appear here. Meanwhile, in addition to planting creative seeds that would bear classic fruit later, The Great Santa Claus Switch also introduced two important people to the world of the Muppets, while welcoming the return of another crucial name. Amongst the many puppeteers brought on to help with this expanded production was Jerry Nelson, who had worked with Jim in the past and who would sign on later this year for the second season of Sesame Street, where he would play a number of smaller parts until finally getting his arguably most iconic character, Count von Count (or the Count, as he’s usually known), in Season 4. Others include Snuffleupagus, Robin (Kermit’s nephew), and Gobo Fraggle. The other two were Fran Brill, the Muppets’ first female puppeteer since Jane left years before, and the first to actually perform her own character’s voices–her most famous being Prairie Dawn and Zoe on Sesame Street, in addition to playing a variety of minor roles on The Muppet Show–and Richard Hunt, the only openly gay Muppet puppeteer at the time, who went on to bring beloved characters such as Forgetful Jones and Don Music to life on Sesame Street, Scooter, Janice, Beaker, Statler, and Sweetums on The Muppet Show, and Junior Gorg on Fraggle Rock. Hunt was actually only 18 when he first auditioned for Jim (he actually called up the offices, hoping to get a job, only to discover that Jim was auditioning new puppeteers that day!) and impressed him so much with his high energy and talent (among other things, he had the best singing voice of all of the puppeteers) that he got the Great Santa Claus gig and stayed with the Muppets for the rest of his life (he tragically died of AIDS in 1992, only mere months after Jim). Therefore, many of The Great Santa Claus Switch‘s weaknesses are made up for today by its importance to Muppet history, despite the fact that it’s so little known or seen today. And, despite it not being the freshest or greatest Muppet material, it certainly has excellent elements. Again, the visual worldbuilding is wonderful. From a production standpoint, it’s extremely impressive, even today, particularly knowing just how far the Muppets came from 1955 to this point. The Frackles are so imaginatively conceived, a true Muppety delight to behold, and many different types of puppetry are employed, including some elf marionettes–the rare Muppets that actually live up to Jim’s early, false answer to reporters that “Muppet” was a portmanteau of “marionette” and “puppet”. The elves try to sneak out in their impenetrable disguises. Additionally, Joe Raposo’s score is fun and bouncy and cleverly brought to life. I particularly love the lyrical bit where Fred sings, “I fix the dolls so each boo-hoos,” and Santa responds, “While you do that, I’ll supervooze” (reminiscent of Kermit’s “suppooze” lyric in Tales of the Tinkerdee), as well as Cosmo’s vow to “leave this Earth just a little bit worse than I found it”. There’s also a terrific number in which, after taking Santa’s place, Cosmo keeps kidnapping each elf one by one, as each suspects something wrong is going on, replacing each one with a Frackle. Every time the song repeats, there’s one less elf and one more Frackle, until by the end, all of the elves are locked up in a dungeon and we are treated to a fully Frackle team of toymakers in little elf outfits! You can watch the special divided into 4 parts, beginning here, and please come back on Thursday for my coverage of the Muppets’ following special, The Frog Prince, from May 1971!